Although the children are taking vacations and beautiful summer weather, but the beginning of the school year is inevitably coming. And if a child is going to the onset of the first class, parents should be prepared not only mentally, but if you have not already done so, also begin to prepare for writing. To practice the correct method of writing a gripping stationery It is the high time. Though it may not seem so graphomotorical development begins with children already in the second year of life. But how to teach your baby to hold writing instruments? It's easy! No need to worry baby does not force him into writing, but all can handle the game. Just nácviková suitable tool with which a child can play or draw, that it will be fun and most importantly it will not ruin the holiday leisure and entertainment. School age is for each family a great event. Imaginary period ends and begins playing time obligations, acquiring new knowledge and skills, time, homework and other school work. One of the most important responsibilities that have to cope with a child, writing, or writing a proper healthy and proper grip pens. Some child holding a writing stationery handles automatically, while others need more care and getting used to writing longer. When you child is slowly going to start school, it is advisable to prepare him for writing easier - for example, through what nácvikového adapter. It is best adapter, which is combined with markers for writing and drawing (eg Mini Colours). Baby you so fine drawing, coloring and form, and yet learn spontaneously correct grip writing and drawing supplies. At present, more and more children problems with the correct form of writing, and especially with the correct grip. More and more schools recommending them to visit the pedagogical-psychological counseling centers where specialists have the opportunity to work with children and gradually improve their skills. Response to this situation as pediatricians as well as stationery designers who work together to find a way to children at boarding school with writing help. It was therefore the need to prepare children for aid to them in writing and his practice will help. When developing so paediatricians and engineers also benefited from the remedial action of writing that is used in clinics. It is a method in which the child put his hand into a ball of crumpled paper and the child due to her grip easily chewed. Now this method has given rise to a new writing needs, which are designed to stimulate the correct grip quite naturally, as mentioned pellet. When to start with the practice of writing? With the practice of writing is best to begin at the time when the child attends kindergarten. Suitable equipment should be part of every good nursery and children's clubs for preschoolers, but definitely not the case provide aid and child home. The correct method for writing so quickly acquire and after the start of school already for it will automatically correct grip. Holding worries after entering school, which will have a first grader and so pretty, and possible remedies incorrect grip can be achieved before starting school. 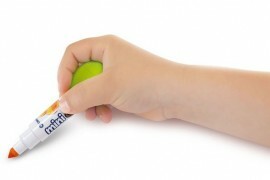 Ideal tool is one that is its diameter (about 4 cm) suitable for children's small hands and is combined with markers (eg marker Mini Colours). In this way, not only is the proper development of fine motor skills, but also correct problems with writing and grip pens.